Lantana Concrete Vent Blocks that you will love are just a phone call away. Call our team of experts at Atlantic Coast Precast today to discuss your specific needs. Our concrete vent blocks are easy to maintain and contain openings that allow air flow for debris to flow easily through the blocks. 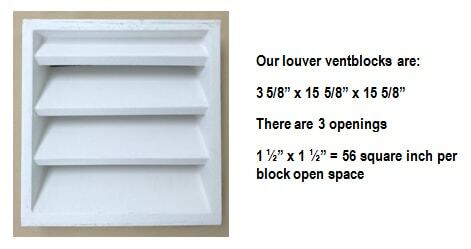 In addition, concrete vent blocks are great for cutting heavy winds and not blocking any ventilation. They are also aesthetically pleasing. We started our business in 1965 and have since then gained a stellar reputation. You will be very pleased with our flawless workmanship, affordable rates, and long-lasting results. Our Lantana concrete vent blocks will not disappoint you! Our customers love our concrete vent blocks, and attract many contractors, architects, engineers, designers, and other industry professionals. The block and screen can be used in garages, range hoods, and foundations for cross-ventilation. It is very important to prevent moisture under your home, which can be done using foundation and exterior vents. They offer great ventilation and are affordable. You will be very pleased with how long they last and how flawless our workmanship is. Lantana, concrete vent blocks can help you prevent termite infestation and damp rot by providing you with adequate foundation vents. They allow air to naturally flow underneath the structure that is being maintained. By keeping moisture levels low you are prevent moisture damage. Our concrete vent blocks have multiple uses that can help keep your property safe from elemental and environmental conditions. To hear more about our concrete vent blocks call us today. We look forward to assisting you!